Butternut squash is my favourite vegetable to love to hate. 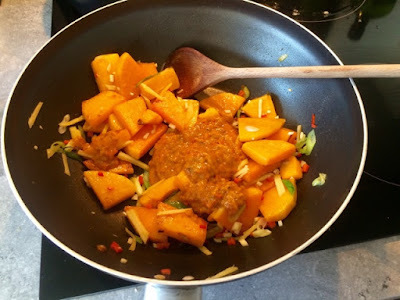 I truly do love butternut squash, I love the flavour, I love the texture, it’s so versatile and works in so many different dishes. What I do not love, is preparing a butternut squash. The last time I was attacking one with a cleaver The Boyfriend came running from the other end of the flat worried that I had broken something/was smashing the flat up. It shames me to say it (as this is something I’m really really against) but I have resorted to buying my butternut squash handily pre-peeled and chopped. I will never buy pre-chopped carrots because it’s cheaper and not remotely difficult to buy and chop a whole carrot, but since the butternut squash has become my nemesis, I’ll stoop to buying prepared veg in this one instance. 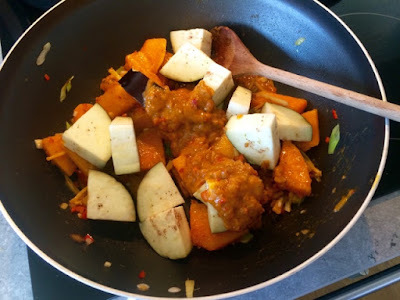 I often make a generic curry from whatever vegetables need using up and whatever curry paste I have knocking about in the fridge. It’s a quick and easy dinner. 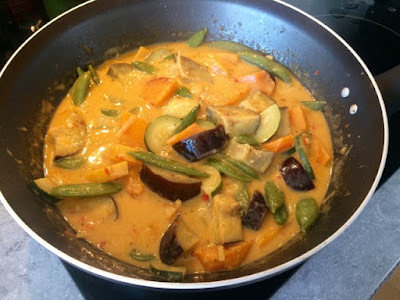 This time however, I wanted to go down the Thai curry route and thought red would make a nice change from green. Red Thai curry used to be a staple of my house back in the uni days and I’ve rarely had it since, so this was a bit of a nostalgic treat for me. We always used to make it with chicken, butternut squash and green beans. I had intended on making this a meaty dish, however after chopping up loads of leftover veg from the fridge and realising how much I had I decided to skip the chicken and go veggie this time. I quite like breaking up the week with a veggie dish. You don’t realise until you skip a meaty meal just how heavy it can be sometimes. Whilst some meat eaters say that a veggie dish doesn’t fill them up enough, I find them a little lighter on the old tummy and feel like I’m giving it a well deserved rest. It’s nice to not always feel stuffed after dinner. 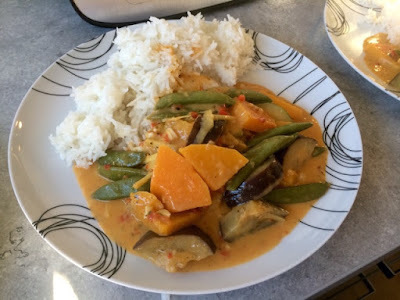 Butternut squash, aubergine and sugarsnap peas all work really well with the Asian flavours but feel free to experiment with your own favourite vegetables. Do try and keep something large, chunky and substantial in there though to keep the variety of texture and prevent it from turning to mush. 1. 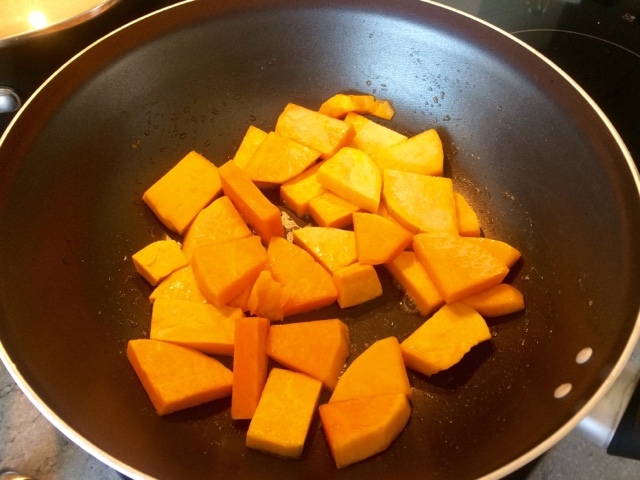 In a large wok, heat the oil and begin to cook the butternut squash. 2. 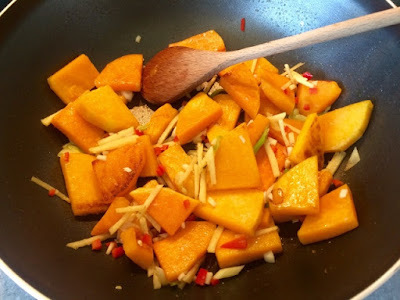 When the squash has begun to soften add the chilli, ginger and garlic, fry for a further 2 minutes. 3. Add the curry paste and stir thoroughly. Cook for 2 minutes. 4. 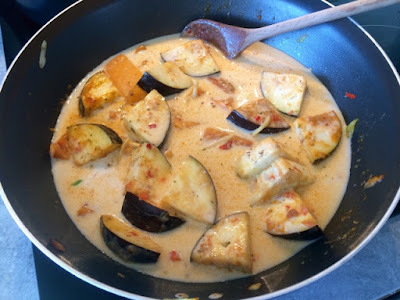 Add the aubergine and cook for a further couple of minutes until starting to brown. 5. Pour in the coconut milk and bring to the boil. 6. Throw in the courgettes and sugarsnap peas, mix through. Reduce to a simmer and cover allowing the sauce to thicken for around 10 minutes. 7. Serve with basmati rice.